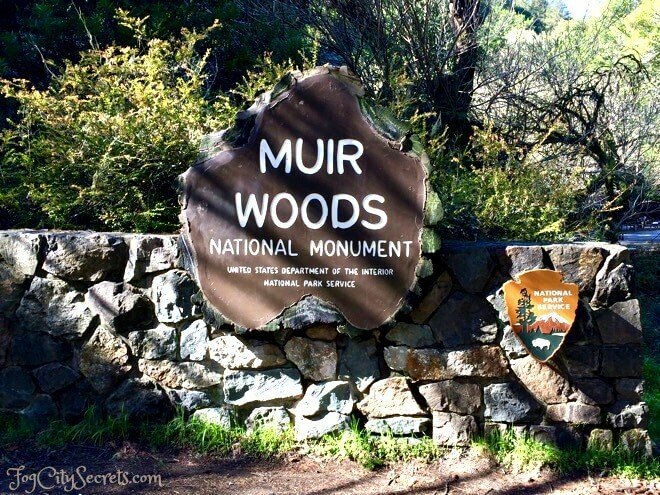 Muir Woods will be closed as of Monday, January 7, for the duration of the federal shutdown. Parking and shuttle bookings will be automatically refunded. Muir Woods is an ancient remnant of the redwood forests that once covered large areas of North America. These amazing trees are now rare, and can now be found in only three places on earth: remote canyons in California, Oregon and China. Everyone should experience the beauty and peace of this magical redwood grove at least once! And a gorgeous collection of these 1000 year old giants is only 12 miles north of San Francisco. People come from all over the world to walk among these magnificent, ancient trees. But Muir Woods has become almost too popular, so I'm including some tips to help visitors enjoy this amazing park. The New Reservation System is in effect. Reservations can be made online or by phone. See Muir Woods reservations, or 800 410-2419. Reservation info. Reservations can be booked up to 90 days in advance. Parking is $8.00 per car, and the shuttle is $3.00 per person (16 and older). There is also a park entrance fee of $10, but you don't need to do that in advance. There are 232 parking spaces; no roadside parking is allowed. Important: because there is no cell phone service in Muir Woods, if you are going to use your cell phone to show your parking or shuttle reservation, download it before you come. Also, reservations are not transferable, so they must me in your name. But people being dropped off, arriving on tour buses, or by Uber, Lyft, or taxi, won't need reservations to enter the park. Only visitors driving or taking the shuttle will have to plan in advance. Visiting San Francisco and don't have car? 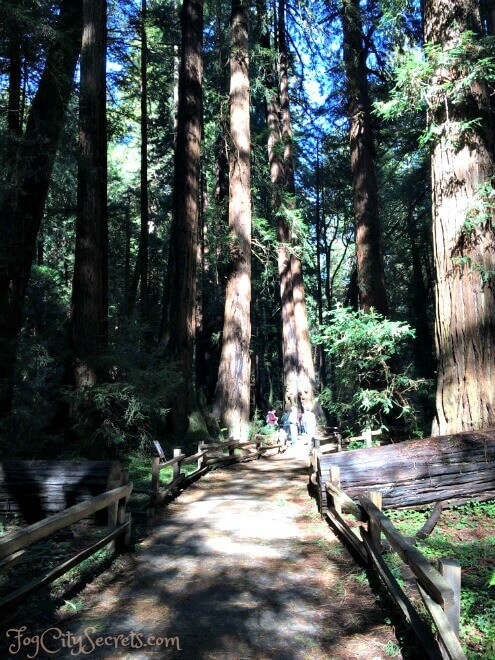 The easiest way to see Muir Woods is to take a tour. 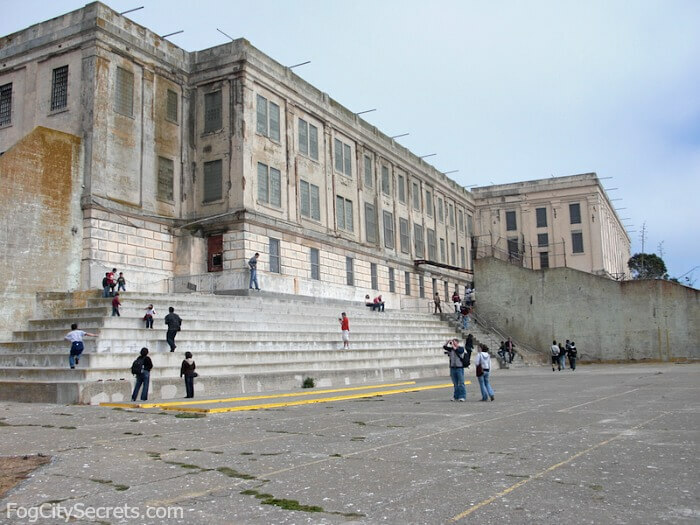 The tours from San Francisco will get you to the front entrance and you'll be picked up there when it's time to return. You can experience the serenity of Muir Woods without spoiling it with traffic and trying to get a parking reservation! All of the tours available for Muir Woods are combination tours with one or more other attractions. You can walk among these wonderful trees, and also visit the charming seaside village of Sausalito, see the wine country, sail on the bay, or tour San Francisco itself. Note: I may earn a small commission if you make a purchase through some of the links on this page, at no extra cost to you. This helps me provide all the free information I post on this website. Thank you for your support! City Sightseeing Bus. Ride across the Golden Gate Bridge on a guided tour to Muir Woods and Sausalito, with a stop at the Vista Point at the north end of the bridge,. Vista Point has one of the best views of the Golden Gate Bridge; a great spot for photos! 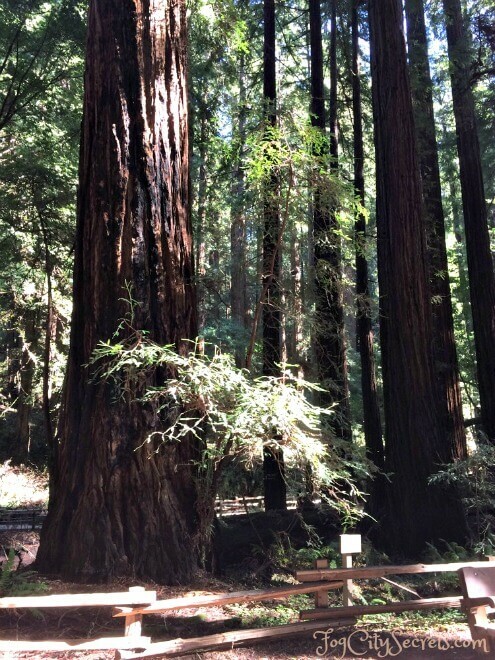 The bus tour takes you to Muir Woods first, where you have an hour to wander the trails among the big trees. After Muir Woods, the tour takes you to the seaside town of Sausalito to eat, browse the shops and galleries, and admire the views. You can also stay longer than the planned stop in the town and take the ferry back to San Francisco, which gives you more time to explore, plus a gorgeous ferry ride across the bay (highly recommended). They have three departure times from Fisherman's Wharf, with the option of being picked up at your hotel. 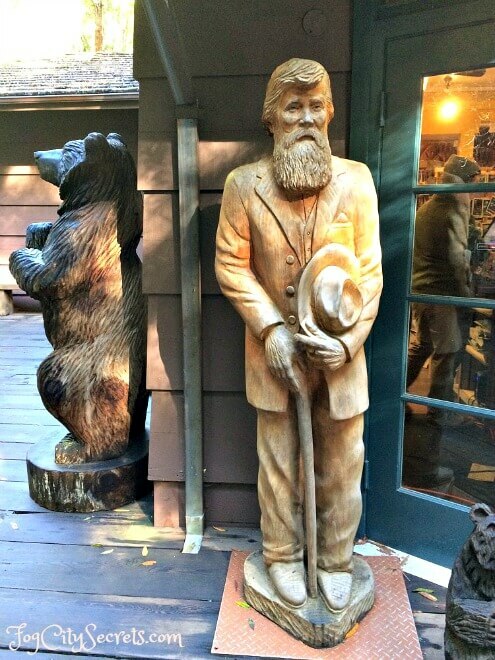 See Muir Woods/Sausalito tour for more info and booking ($5 off if booked online). Explore Muir Woods, Sausalito and the Wine Country all in one day. 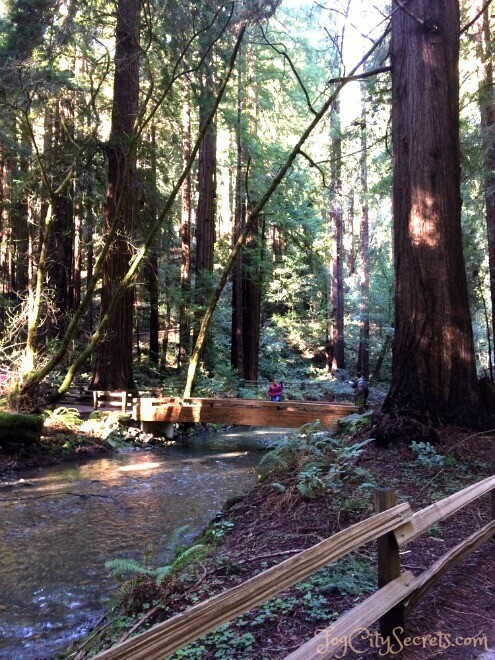 You're picked up at your hotel, then it's off to explore the redwood groves of Muir Woods. After enjoying the old forest, your guide takes you to the seaside town Sausalito where you can check out the shops and views. 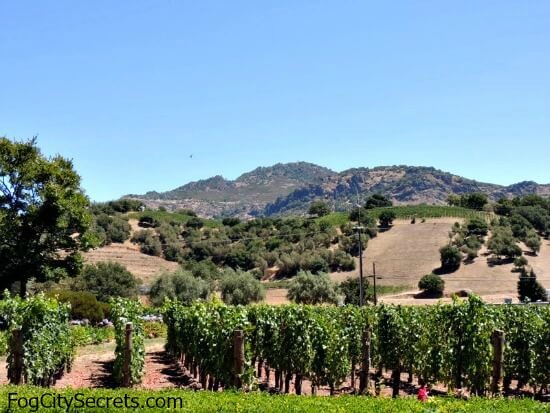 Next, your guide takes you up to the lovely Sonoma Valley for wine tasting at two wineries. Hotel pickup included. 9 hours. For more info and booking, Muir Woods/Sausalito/Wine Country tour. It's $5 off to book online. Have a guide take you north to Muir Woods to experience the beauty of walking amongst the world's oldest and tallest trees. 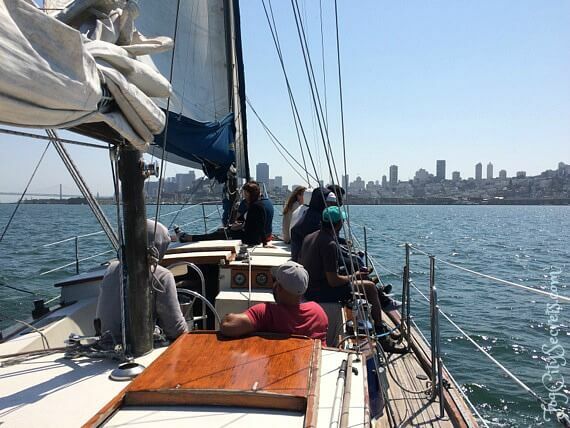 See Sausalito with its charming waterfont and shops, then spend an hour sailing on the bay, past Alcatraz and out under the Golden Gate. Great views! Hotel pickup and entry fees included. 5 1/2 hours. For more info and booking, Muir Woods/Sausalito/Bay Cruise tour. See below for other ways to get out to Muir Woods. In a nutshell, driving, taking the shuttle, or using Uber or Lyft. The Muir Woods shuttle doesn't run on weekdays (except for June 18 to August 10, 2018), but it's a good way to get there when it's running. Advance reservations required. Redwood forests have been tucked into these misty canyons along the California coast for thousands of years, and some of the giant trees in Muir Woods are over 1000 years old. The coastal redwood is the world's tallest tree. California has two varieties of redwoods: the coastal redwood (Sequoia sempervirens) and the giant sequoia (Sequoia dendron giganteum). "Sequoia" comes from the name of Sequoyah, the Cherokee who invented an alphabet for his people's language. Muir Woods has coastal redwoods, which are also found in a number of special spots up and down the coast. The giant sequoias are found in several parks on the western slopes of the Sierra Nevada mountains (in Yosemite, Sequoia and Kings Canyon National Parks). Differences: the coastal redwoods grow to only (!) about 20 feet wide, while the giant sequoias are up to 40 feet wide. Both species can be over 300 feet tall, with the coastal redwoods reaching about 60 feet taller. Redwoods as a species are beyond ancient; they have been on earth for 150 million years and used to live all across the Northern Hemisphere. Individual redwoods can live over 2000 years, and are amazing survivors due to some interesting characteristics of their structure. Fire is good for redwoods. These trees are helped when forest fires burn out the undergrowth; seeds can reach the soil easier, and are less likely to be damaged by fungus and bacteria living in the brush. In addition, the bark of a coastal redwood is at least 6 inches thick, and can be up to a foot deep. That, plus the high tannin content, makes the redwood quite resistant to fire. No bugs! The tannins that resist fire damage also make the tree unappealing to insects. You will notice a minimal number of flying insects and creepy-crawlies while strolling in the grove; another happy fact about redwood forests! Life in the fog belt. Coastal redwoods need a damp, drippy environment. As a result, they live only within the fog-drenched strip of land that runs along the ocean from Northern California up into Oregon. They get moisture directly from fog condensing onto their leaves as well as from water that drops down to the forest floor. These redwoods tend to be found in canyons near the ocean, where they are protected from the wind, near streams, and where shade and fog create a milieu where they can flourish. Fairy Rings and Cathedrals. Because of the way redwoods reproduce, they sometimes create majestic circles of trees that look like they were planted. In addition to dropping seeds from their small cones, redwood trees grow lumps called burls on their roots and bases. These burls can sprout and grow into trees if the parent tree is damaged or dies. The trees remaining after the original tree has died and decomposed are often standing in circles. Cathedral Grove in Muir Woods is one of these impressive arrangements. Timber! Coastal redwoods have very shallow roots for their height and weight and as a result are known for falling over. Californians living in redwood areas are aware of the hazard; it's not unusual for these trees to come down in a storm. Unfortunately, they're not as stable as many other species. 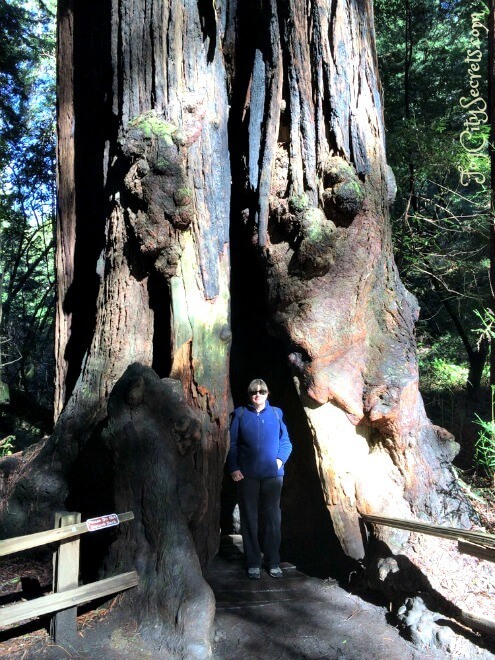 The oldest redwood in Muir Woods is over 1200 years old! Many of the trees in the grove are over 600 years old. A number of animals make their homes in Muir Woods, but it is not heavily populated because a redwood forest is not the best place for them to find food. Black-tailed deer come out to feed at dusk and dawn, and chipmunks and squirrels are around most of the time. 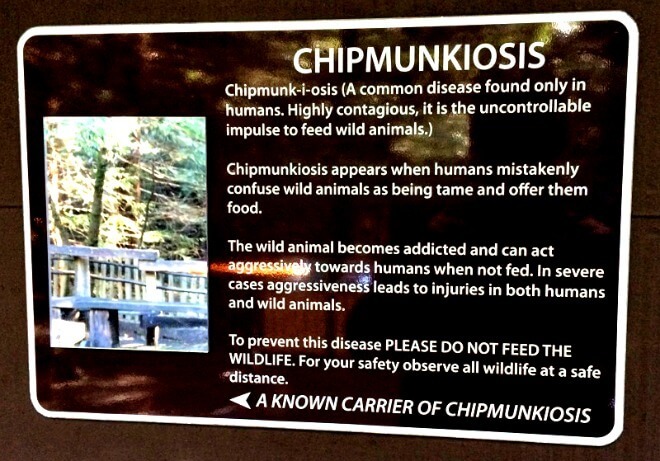 Muir Woods has a funny way of telling people not to feed the wildlife. That's a mirror on the left. The abundant coyotes of Marin County don't come in much and the official word is that mountain lions haven't been seen here, though they are definitely living on Mount Tam. I'm almost certain I saw a mountain lion run across the path when I was hiking on Mount Tam years ago. There are no poisonous critters in Muir Woods. You might see a garter snake or rubber boa, and salamanders, lizards, and banana slugs are residents as well. Banana slugs have 27,000 teeth (!) but only eat decomposing plants. Coho salmon (endangered) live in Redwood Creek that runs through Muir Woods. The young salmon live in the creek for a year, then migrate to the ocean for another two or three years. At around three to four years of age, they swim over 100 miles to get back to Muir Woods; they navigate (possibly) using the earth's magnetic field and find their home stream by smell when they get close. 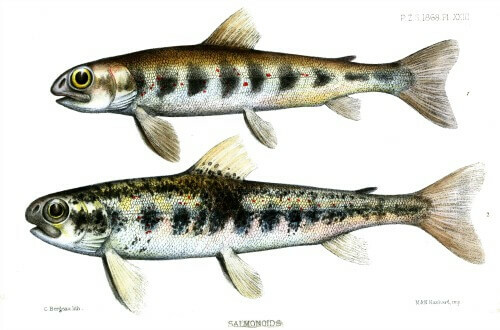 The adult salmon average 28 inches and return during the winter rains (November through January) to spawn and die. The eggs hatch in the spring. Tip: the baby salmon are in the creek year round, and the best place to look for them is from the bridges. They can be anywhere from 1/2 an inch up to 8 inches, depending on time of year. Steelhead trout also call Muir Woods home. The often-mentioned, endangered, Northern Spotted Owl lives in Muir Woods, but they sleep in their nests in the tree tops during the day, so they are rarely seen. Early History. The Miwok Indians who lived in this area probably never lived in the Muir Woods canyon itself, since they normally settled in areas close to their marine food supply. The first European to own this land was William Richardson, who got a land grant from the Mexican government in 1838. Gold! The extensive logging that followed the discovery of gold in 1949 cleared out much of Marin County's timber, including many stands of ancient redwoods (as well as eliminating the grizzly and black bears, who never returned). But the trees in Muir Woods survived because the canyon was so rugged. The mountain lions and coyotes are still around, though the lions are rarely seen in Muir Woods itself. Muir Woods had a close call and almost didn't make it. In 1905, the local water company tried to have the land condemned so they could dam the creek running through it, but the owner, Congressman William Kent, donated the land to the federal government. In 1908, President Theodore Roosevelt declared Muir Woods a national monument, only the 7th one to be created. The park was named after John Muir, the well-known environmentalist and founder of the Sierra Club. Muir Woods is a long, narrow stretch of redwood forest that follows Redwood Creek, in one of the steep canyons on the western side of Mount Tamalpais. It's located only 12 miles north of San Francisco, about a 20 minute drive from the Golden Gate Bridge. As you can see on the map below, the trail through Muir Woods goes through a series of bridges that cross Redwood Creek. The bridges make it easy to figure out how far you want to go and how much time you need. The trail is paved or has wooden planks all the way to Bridge 4, so it is an easy, flat stroll, and wheelchair accessible, all the way to the last bridge. The trail passes on both sides of the creek from Bridge 2 to Bridge 4, so you can loop back on a different path. Bridge 1: a short walk past the entrance gate, and right next to the cafe and gift shop. Bridge 2: 1/2 hour round trip loop. Passes the Bohemian and Founders Groves. Bridge 3: 1 hour loop. Just past this is the Cathedral Grove - worth seeing. Bridge 4: 1 1/2 hour loop. Redwoods peter out after this. The first thing many people notice about Muir Woods is the silence. There is a stillness there that is remarkable, perhaps in part due to muffling aspect of the trees and steep hillsides, and the absence of wind. Even the birds seem quiet there. In winter and spring, the creek is full, and you'll hear the sound of rushing water. The named groves are particularly impressive clusters of large redwoods. The Bohemian Grove. This stand of redwoods is where the famous (or notorious?) Bohemian Club held a meeting there in 1892, complete with a 70 foot statue of the Buddha (long gone). The Founders Grove. This recently-named grove is dedicated to the men who were instrumental in saving Muir Woods. The boardwalk has been expanded and the PInchot Tree is here (a big one). The paved pathways are gradually being replaced by redwood plank footpaths. The Cathedral Grove. This is my favorite spot. A beautiful enclosure of towering redwoods, aptly named. It was here on May 19, 1945, that the U. N. delegates came for a ceremony to honor President Franklin D. Roosevelt. The delegates from 50 countries were in San Francisco to create the United Nations, and the president died just before the signing of the charter. One of the trees in this grove, an enormous 800 year old redwood, fell over in 1996, and you can see it lying against the hillside where it fell. Muir Woods is part of the Mount Tam system of trails. There are over 50 miles of trails criss-crossing Mount Tam, and several leave from or pass near Muir Woods. 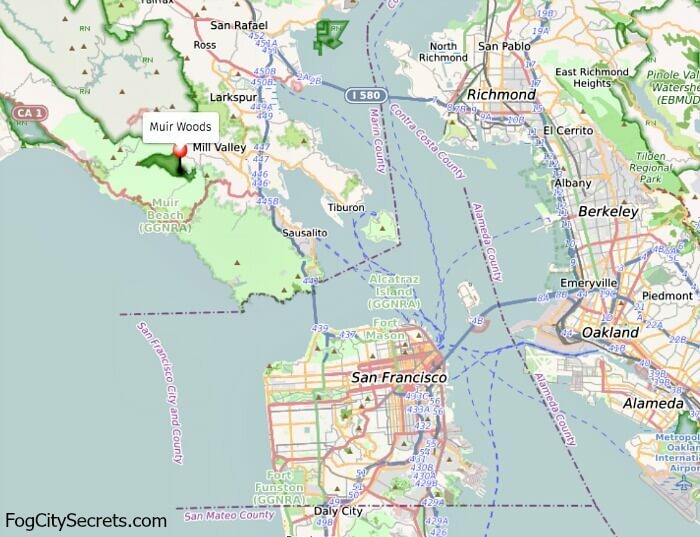 Here's a good map of the Mount Tam trails, including the Muir Woods trails: see trail map. I've listed a couple of popular hikes below. For a great resource listing all the hikes in redwood forests throughout California, see redwoodhikes.com. Ben Johnson/Dipsea Loop: an all-day hike, moderately strenuous. Starts at Muir Woods, just off the overflow parking lot. Then follow the Ben Johnson Trail to the TCC Trail, then the Stapleveldt Trail, joining with the Dipsea Trail, and back down into Muir Woods. See hike for map and details. 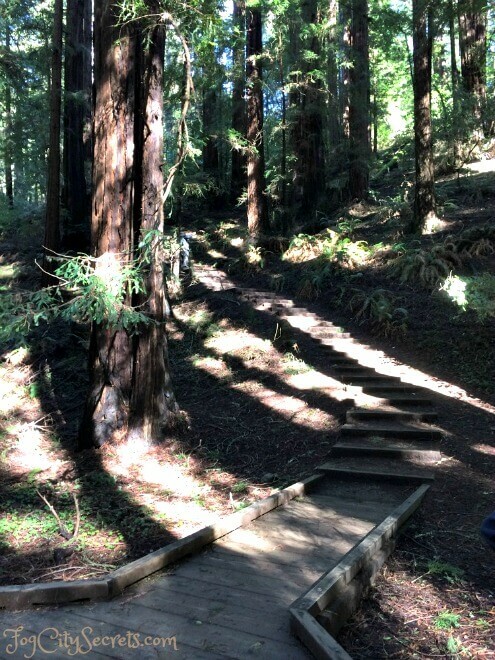 Sun Trail: another all-day, moderately strenuous hike, which takes you up on the hillside east of Muir Woods, past the cool Tourist Club chalet, then along the Redwood Trail, Lost Trail, and Fern Creek Trail before rejoining the trail in Muir Woods. Leaves from the main parking lot. See hike for map and details. You'll see the Visitor Center as you approach the entrance to Muir Woods. This is the place to pick up a trail map. The Cafe is a cosy, rustic spot to recharge after your hike. They have a nice assortment of sandwiches and pastries, plus salads and fruit, all from local farms. Cheddar onion scones...yum! Even peanut butter & jelly sandwiches. Plus some interesting honey sticks at the register (we tried the tasty cinnamon and blueberry ones). The Gift Shop next door has lots of wooden items made of redwood, and some pretty turquoise jewelry. Even baby redwood trees! But where would you put one? 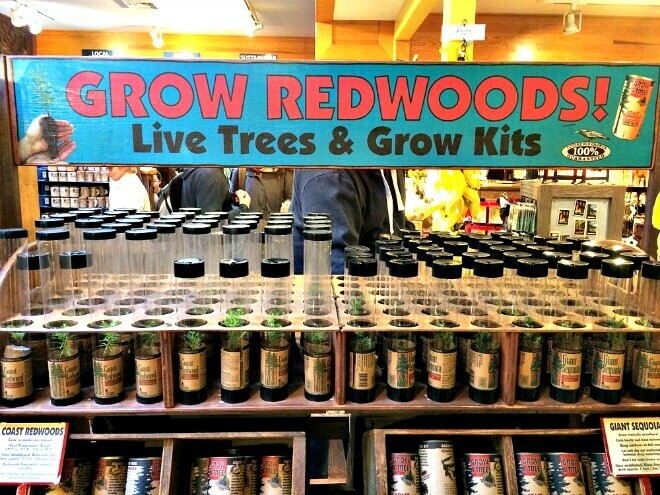 Want Your Very Own Redwood Tree? $10 for ages 16 and over. Annual pass: $40 for one person plus three guests. Free for holders of National Park Passes. See passes for how to get one. Muir Woods is open 365 days a year. Open 8:00 am till sunset. 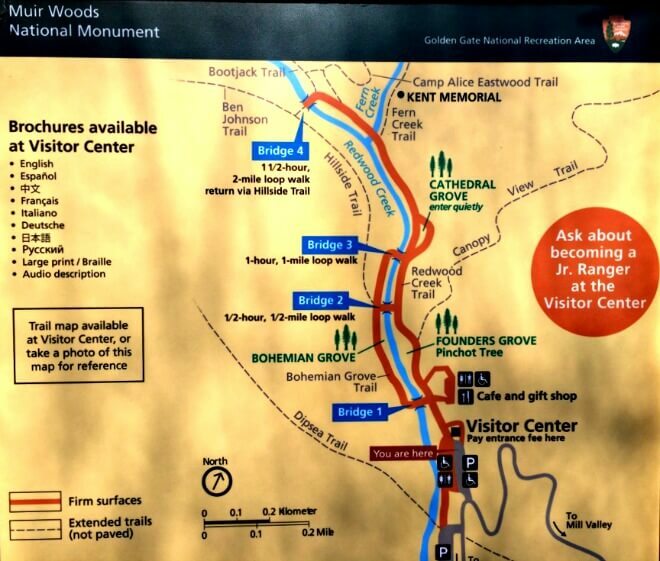 Visitor Center (trail maps) and Cafe & Gift Shop open at 9 am. Dress warmly, in layers. The woods are lovely, dark and deep, i.e. cool and shady, much cooler than the surrounding countryside. There is no cell phone reception in Muir Woods. They do have a pay phone near the entrance, though. Don't wait for the last shuttle; it may be full. Only bathrooms are in the Visitor Center and the Cafe, near the entrance. Allow at least an hour for a visit; 90 minutes is better. Try and make it past the 3rd bridge to see the Cathedral Grove. If you want parking, reserve a space well in advance. The shuttle must also be reserved in advance now. It's a fairly easy drive to get to Muir Woods; it's only about 20 minutes from San Francisco (unless you hit commuter traffic during the rush hour-ugh). The real challenge is getting rid of your car once you're there! Reservations are required for parking. From SF: head north over the Golden Gate Bridge on Highway 101, and take the Mill Valley-Highway 1-Stinson Beach exit. follow the signs to Highway 1, then the signs to Muir Woods. From the East Bay: take Highway 580 over the Richmond-San Rafael Bridge (west), then go south on Highway 101. Take the Stinson Beach-Mill Valley exit, then follow the sign to Highway 1 and Muir Woods. Note: Vehicle size limitations. 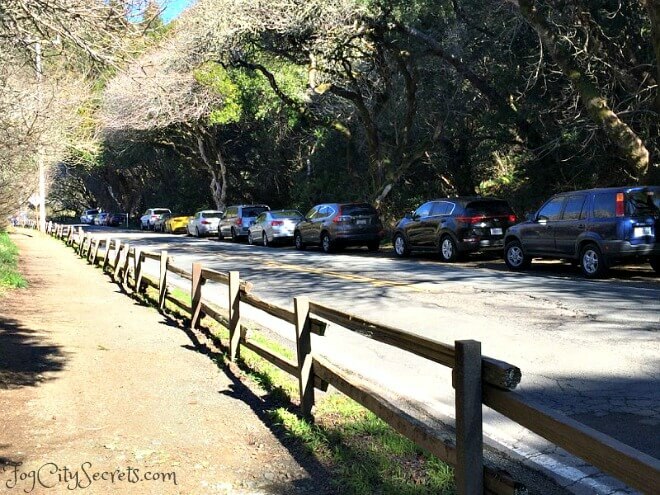 Because of the heavy rains last winter, there was damage to the road leading into Muir Woods and they don't allow vehicles over 35 feet on the road. Also, there is no parking available for RV's at Muir Woods. Parking at Muir Woods is a painful subject. There are two, rather small parking lots near the entrance, and that's it! Somehow, they'll supply 232 parking spaces. No parking is currently allowed along the road; before, the cars used to stretch out along the road for miles during the high season. Only parking in the lots is allowed, and all parking places must be reserved in advance; no parking permits will be sold at Muir Woods. To reserve a parking spot, go to parking reservations. Look in the upper right corner of that page and click on the date you want and "reserve now". The bookings for the shuttle and parking are on the same page. Over a million people visit Muir Woods every year and it has gotten so popular, it's become a threat to the natural environment. 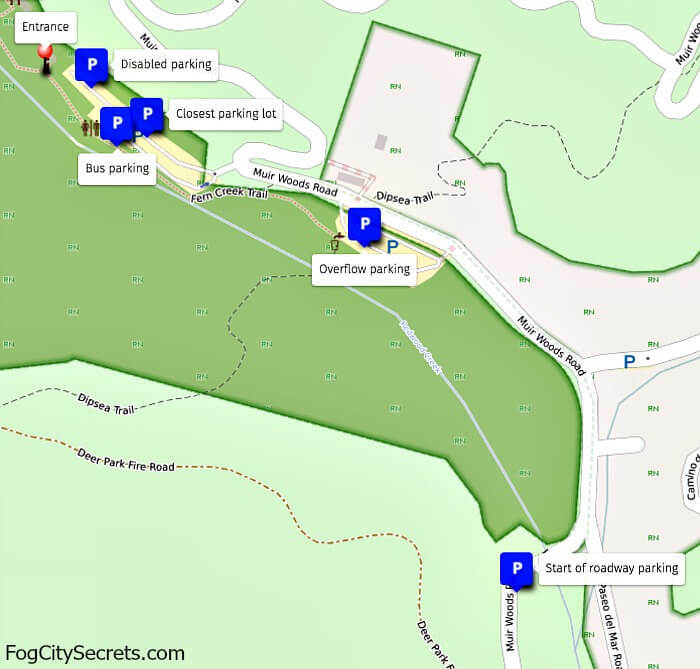 The narrow mountain roads and limited parking just weren't made for the numbers that want to see the park, so this plan is designed to take some of the load off. Disabled parking. There is a lot for holders of disabled parking permits next to the Visitors Center, and visitors can also be dropped off in front of the entrance. There are 8 disabled spaces available and they must also be reserved in advance through the new reservation system. Tour bus parking. There is also an area where the tour and school buses park, close to the entrance. If you want to drive in, and weren't able to get a parking reservation, a great alternative is to reserve a spot on the Muir Woods shuttle, Marin Transit Route 66/66F. It's $3 roundtrip for travelers 16 and older, free for kids. Note: you must have reservations for the shuttle. They are specific to the shuttle stop (3 of them), and for a specific time, or 30 minute window, depending on the stop. You can't buy a ticket at the bus stop. To reserve it, see shuttle reservations (top right of that page). 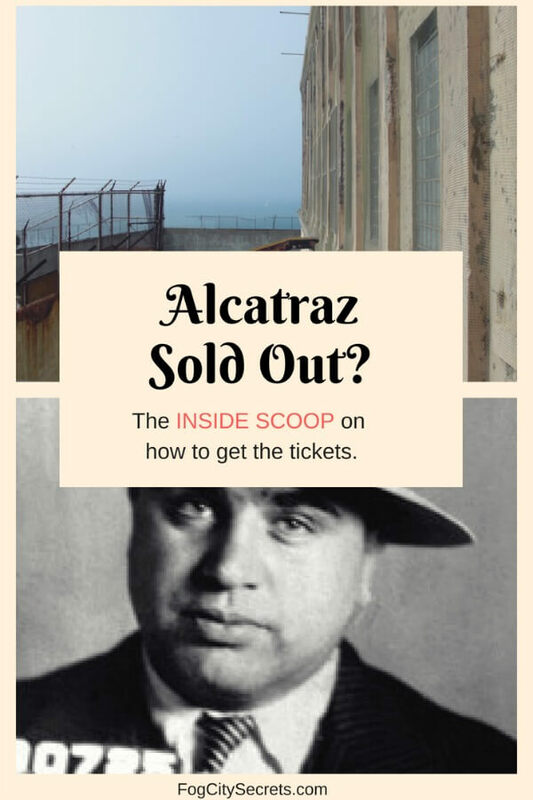 Tickets: your tickets will be sent electronically, and can be printed out, or you can use the digital version on your smart phone (but there is no cell phone reception in Muir Woods, so you'll have to load it on your screen before you arrive if you need to display it there). Marin Transit passes and Clipper Cards aren't accepted for the shuttle. Starting January 20, 2018, the shuttle will run weekends and holidays, all year round. During the summer, the shuttle will also be available on weekdays (from June 18 to August 10, 2018). For the current schedule, see Muir Woods shuttle (Marin Transit Route 66). Pohono Street, off HWY 101 past Sausalito (weekends only). Marin City Bus Hub (Donahue & Terners Sts.). Sausalito Ferry area (Bridgeway & Bay Sts.). Which shuttle stop is best? If you're driving, I recommend the Pohono Street stop on weekends and, in summer, the Sausalito stop on weekdays. Parking is a lot easier at the Pohono Street stop. If you're coming by ferry from San Francisco, the Sausalito stop is of course the best one, since it's only a couple of blocks from the Sausalito ferry landing. Note: the Pohono Street Park & Ride stop has a free parking lot, but the shuttle only stops here on weekends. There is also another parking lot nearby you can use to catch the shuttle on weekends, Manzanita Park and Ride, just on the other side of the Highway 101 (use the underpass to walk under the freeway to the Pohono Street stop). The bus stop for the Muir Woods shuttle is well-marked with a sign. 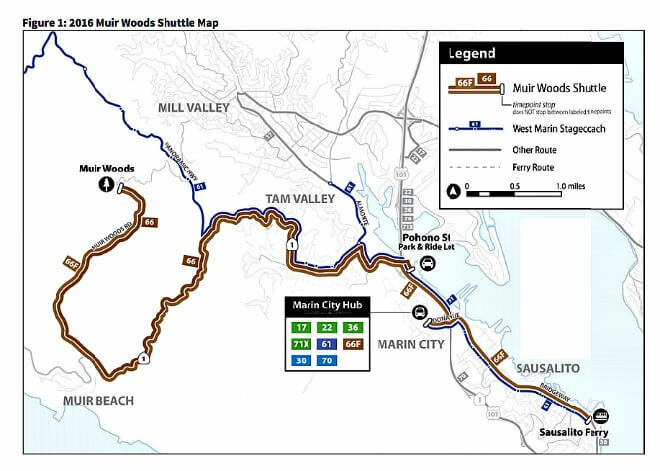 On weekdays (summer only), the only Muir Woods shuttle stops are the Sausalito Ferry stop and the Marin City Bus Hub. 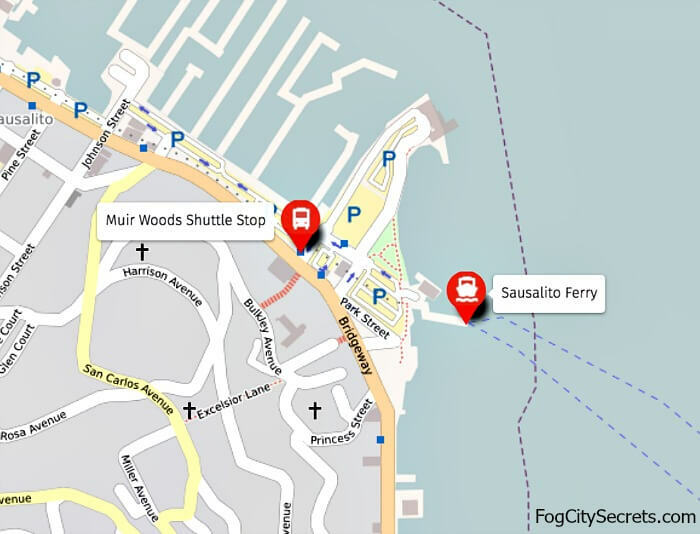 The shuttle stop for the Sausalito Ferry is at the intersection of Bridgeway (the main street going through Sausalito) and Bay Street, near the ferry terminal in Sausalito. 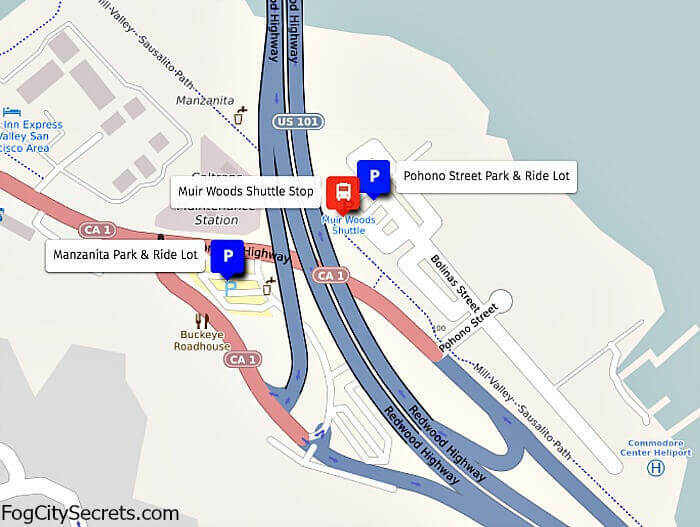 Parking isn't free but there are parking lots available (see Sausalito parking). The Marin City shuttle stop is at the major transit hub located at Donahue and Terners Streets. Unfortunately, this is not the safest area; there have been problems with robberies at this bus terminal off and on over the years. I suggest catching the shuttle in Sausalito. Insider tip: don't plan on taking the last shuttle out of Muir Woods; it may be full, and you won't get on. Then it's calling Uber or a taxi from the pay phone (no cell phone service)! One of the easiest ways to get to Muir Woods without a car is to take a tour from San Francisco (see above). Other than taking a tour, the choices are taking a bus or ferry from San Francisco to catch the Muir Woods shuttle in Marin, or taking Uber, Lyft or a taxi. Can you take public transportation from San Francisco to Muir Woods? But note: the Muir Woods shuttle doesn't run on weekdays for most of the year. And visitors must have reservations to take the shuttle; no tickets are sold by the bus driver and Clipper cards aren't accepted. There are two ferry lines that run to Sausalito from SF. 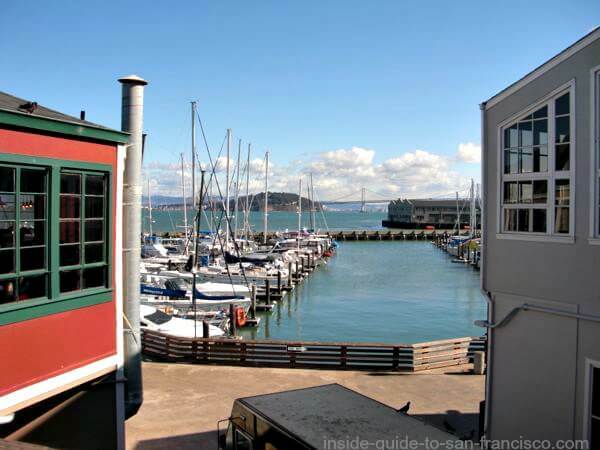 You can take a Sausalito ferry from the Ferry Building (Golden Gate Ferry) or from Pier 41 at Fisherman's Wharf (Blue and Gold Ferry); they both use the same ferry terminal in Sausalito and you can catch the Muir Woods shuttle at Bridgeway and Bay Streets nearby. Both ferry rides take about 30 minutes, and cost about $12 one way. These ferries don't fill up so there's no need to make reservations or buy tickets ahead of time. Golden Gate Transit has three bus lines that have stops in downtown SF and will take you to the Marin City Hub (30, 70 & 92). One of lines, Route 30, also stops near the Sausalito Ferry terminal at Bridgeway & Bay where the Muir Woods shuttle picks up. This bus runs hourly, 7 days a week, from 7th and Market, as well as other SF stops (1st & Mission, McAllister & Polk, Golden Gate Bridge Toll Plaza). See Bus 30 Schedule. Tip: I recommend taking the Route 30 bus and getting off in Sausalito. Sausalito is a safer (and prettier) place to wait for a bus. Hop up to the shuttle section for all the details on taking the shuttle. Note...the shuttle doesn't run on weekdays except for June 18 through August 10, 2018. So it's Uber or Lyft or a taxi for weekdays in the winter months, or taking a tour bus. Uber and Lyft are both available in the Bay Area. A trip to Muir Woods from San Francisco, for example, would run about $22 one-way (but can vary quite a bit). Nice, because you get dropped off at the front door and don't have to stress over parking! How it works. For those not familiar with these services, these companies hire regular folks with cars (and no criminal or bad driving history, supposedly!) to drive people here and there. They have apps you can download and when you put in a request online, any driver in the area can agree to accept the trip. You are told who your driver is and can see where they are on the map via GPS. You pay online so no money changes hands during the trip. Warning! There is no cellular reception in Muir Woods, so you can't use your cell phone to get a return ride! They even post warning signs on the inside of the bathroom stalls because it's been such a problem. The solution is to use the pay phone (remember those?) at the entrance to call for your return ride, or to make arrangements in advance. Yes, in San Francisco and beyond! In San Francisco. There are actually redwood groves in the city of San Francisco itself. Not as impressive or ancient, mere infants compared to the Muir Woods trees, but pleasant and serene. There is a pretty, 100-year-old grove in the San Francisco Botanical Garden, and another grove of 60 tall trees at the foot of the Transamerica Pyramid. Hard to think of a more unlikely location! Most people, including locals, don't know it's there. The Transamerica grove was planted on the former location of a famous Bohemian establishment; Mark Twain, Bret Harte, and many other famous writers used to hang out there. You can also see the jumping frog fountain built in Twain's honor. Golden Gate Park also has several redwood groves tucked here and there. For more on the groves, plus an overview of the many gardens in the park, see Gardens in Golden Gate Park. Big Basin Redwoods, Santa Cruz. If you have a car, there is a gorgeous, large, old-growth redwood forest in the Santa Cruz Mountains, about an hour and 20 minute drive from San Francisco. There are 80 miles of hiking trails in Big Basin Park, and lots of campsites among the redwoods. We went camping there when my son was little and it was lovely, in spite of some very bold raccoons that joined us for dinner! Fun Tip: there is a cool excursion from the Santa Cruz Boardwalk up to the redwood forest on an old steam train. It used to be used for logging, but now visitors can ride this historic train up into the mountains, through the tall trees, and across the river gorge on a trestle bridge. The train leaves from in front of the boardwalk in Santa Cruz and goes up to Roaring Camp in the mountains. Takes 3 hours roundtrip, and costs $31. See Roaring Camp Railroad for more details. For a shorter trip, one hour round trip, Roaring Camp Railroad has another steam train ride through the redwoods that goes higher up into the mountains, also crosses a gorge and runs on a narrow gauge track. This trip leaves from Roaring Camp in Felton, just outside of Santa Cruz. Costs $29, but appears to be available for $27 to book it through Viator: see Roaring Camp Train Ride for more info and booking.